A ChineseLong March rocket hauled a new navigation satellite to a high-altitude perchover Earth on Saturday, marking the first space launch of the year for theworld's space programs. The LongMarch 3C rocket blasted off from the Xichang space center at 1612 GMT (11:12a.m. EST) Saturday, or just after midnight Sunday morning local time, statemedia reported. The180-foot-tall booster flew east from Xichang, which is situated in Sichuanprovince in southwestern China. The Beidou, or Compass, navigation satellitewas placed on a trajectory toward geosynchronousorbit, according to the Xinhua news agency. Thesatellite is the third member of the second-generation Beidouconstellation. Two spacecraft were launched to medium Earth orbit andgeosynchronous orbit in 2007 and 2009, respectively. 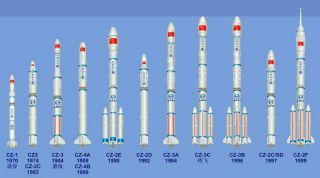 First-generationsatellites were launched between 2000 and 2007 to test the Beidou concept inspace and provide limited services for China. China eventuallyexpects to launch 35 Beidou satellites, allowing the system to have a globalreach similar to the U.S. Global Positioning System. Russia operates a fleet ofGlonass navigation satellites, and Europe is developing the Galileo satellitenavigation system. Officialshope the Beidou system will provide navigation, timing and messaging servicesto the Asia-Pacific region by 2012, Xinhua reported. China saysBeidou services will be available at no charge to civilians with positioningaccuracy of about 10 meters, or 33 feet. More precise navigation data will begiven to Chinesegovernment and military users, according to Xinhua.